Christian & Stephanie remain in critical condition at Maricopa Burn Center where they are expected to be in a chemical induced coma for several months. The Nielson’s hospital bills are expected to be in the millions. Christian has sustained burns on over 30% of his body. His wife Stephanie’s body was burned over 80%. "For the past four years, Stephanie has welcomed us into her charming abode through the NieNie Dialogues. Far from being a product of creative editing, the Nielson’s don’t just shine through the selective lens of a blog. They are ingenuous examples of family devotion, eternal romance, and Christ centered faith." Knowing the financial burden at hand, Demi-Dos is eager to join the club of rallying friends and family. 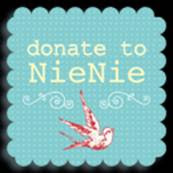 We will be donating a portion of all of our proceeds from the 2008 Swiss Days to Nie and her family. If you would like to make a monetary donation you may do so at Any Wells Fargo Bank under “Stephanie Nielson Fund or at any Bank of America under the "Christian and Stephanie Nielson Rehab Fund."